If you caught my previous posts on the differences between Germany and the US, you might remember the seemingly basic daily activiity of running errands can be quite different already. Today, we’re returning to the supermarket once agan and then delve into the dangerous 😉 territory of eating out. Can’t be that hard, you’re saying? Just wait for it! Yes, that’s right. Stores don’t stop at the carts there. Thirsty? Grab a bottle of your favourite beverage from the shelves but be aware that the price noted isn’t the full one yet. When you pay, the store system automatically adds a so-called ‘Pfand’ – typically 0,25 € per bottle – to the price stated on the shelf. Don’t worry, though: you get your Pfand back when you return your empty bottles to the store. And if you’re anything like me you feel just that little bit feisty in getting a – actually only mental – discount on your next purchase that way. Waiting at the restaurant door to get seated? Nah. Just get inside and seat yourself wherever you please – unless there’s a reservation sign on a table, obviously. Unless you’re at a fancy restaurant or one that specifies reservations are necessary, it’s the norm to pick whichever table you want and waiters will attend to you soon. Waiting staff isn’t assigned certain tables. In fact, it’s not unusual to have one waiter pick up your order and another cash you at the end. Now we’re not talking tap beer – locations that have it will gladly serve you up a foamy cold beer, no worries. But asking for tap water along with your meal? I’m afraid to tell you that’s not so much of a thing here; potentially even looked down upon as a cheap opt-out of ordering a beverage you’d have to pay for. Bottled water is the norm – whether it be ‘still’ or ‘sprudelnd’ (sparkling). The latter is what the majority of us go for – so refreshing! It’s what I keep at homes at all times, too, though I occasionally just have some straight from the tap, too. If you remember the rush at supermarket checkouts I told you about this right here is the amazing opposite. Unless the restaurant lets you know they already have a later booking for your table, you’re free to take all the time you want. If you’re long finished and can tell there’s a request for more room it’s obviously not the most impolite thing to get up and leave but ultimately it’s up to you. Nicely satisfied by your meal yet left with some remainders, you might figure you can just get them doggy-bagged for another day. Good luck on that one in German restaurants. As awesome as I personally consider this concept – avoiding food waste is always good – it’s not common in Germany. The only place I’ve had a chance to take leftovers home because they did in fact have boxes for it was Vapiano. Unlike in the US, German waiting staff doesn’t depend on your tip making up most of their salary. This doesn’t mean they didn’t appreciate it as much [you still don’t make a fortune as a waiter]; it’s just not that you’re required to. Most restaurant goers still tip unless the service was terrible. Since staff doesn’t ‘expect’ you to give it, the common practice is to ask your waiter for the bill [note that it doesn’t automatically arrive at your table after you finished your meal; see point below on taking your time]. When he shows up at your table with it, hand them over – yes, another situation where many of us use cash rather than credit cards – the money and say how much you want to pay. I.e. if your bill says 33,20 € and you enjoyed the service, you might hand them 35 and say “stimmt so” [as in: that’s right = keep the remainder] which then indicates how much they get to keep to themselves. And that’s it for another episode of the small but important differences between Germany and the US. Happiness-inducing today: A short uplifting conversation after a rough day at work. Which one of these surprised you the most? What differences between your homecountry and places you’ve traveled to have you noticed before? Joyful days, heavy thoughts and sunshine. Sunshine! Summer, er, spring! Is it apparent I’m really appreciating the sun finally blessing us with so many hours of its presence? No matter what’s going on in my mind [no shortage of ramblings, ever]: sunshine helps. Something I’ve noticed – and admittedly not for the first time – is that I tend to eat my feelings. The past few days of having family and at that loved ones around, my appetite even disappeared at times. Yet a few things enraging me brought back the urge to eat just because I couldn’t adress the true issue at hand. This is frustrating to say the least. A lot of the anger and frustration inducing this came from what should actually have brought only joy. Family and friends visiting. And spending time with family members, some of which I hadn’t seen in way too long, did fill those happiness batteries. It was the arrival of some unexpected guests, strangers to me, staying in my apartment, that irritated and angered me. For the sake of privacy even of people I’m not on good terms with I won’t go into details. What I can say is that the way they behaved and the return of feeling like an intruder in my own apartment got to me more than I’d like to admit and I let it take away from the overall joy a family weekend could have brought. Missed chances – whatever they are about – never feel good. But I’m not here to spread gloominess. Despite some additional not so happy happenings, the week still had its silver linings; sunshine being an obvious one here. Here’s a look at the past week of life as inspired by our lovely host Meg. Spent time with the family – this really made up the biggest part of my week. Several aunts [plus husband respectively boyfriend] cousins, my sister, her husband and P, my brother, his girlfriend and four of their friends visited us for the weekend. 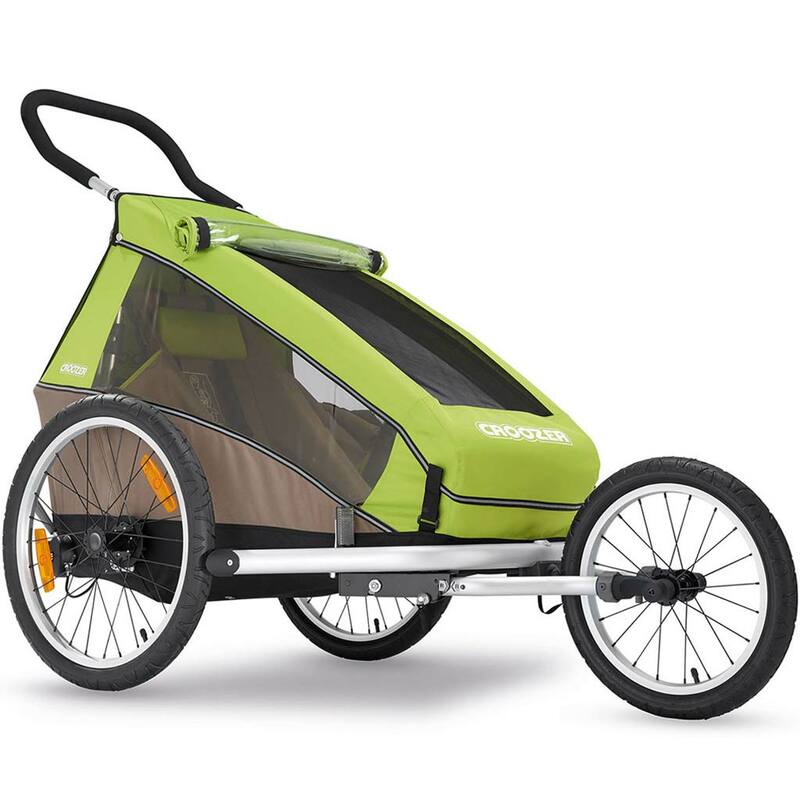 Went on the first longer bike ride of the year with part of the family, including P. in his cool new Croozer[and muscle soreness in my derierre for good measure afterwards]. Also worked up a belated tan aka got a mini sunburn on my forehead. It’s looking pretty now and didn’t hurt at all so no complaints there. Went on a walk with one of my cousins that allowed for a deeper conversation and catch-up on some parts of her life I hadn’t know about before. Slept many many hours around the weekend. Most definitely catching up on sleep from the past two weeks or so. Major win for going to bed earlier every day this past week. Not early as in early for you guys – need to hold up my night owl status after all; it’s just me – but it was an improvement compared to past weekends in particular. Fingers crossed I’ll keep it up this week. Goodness knows I need my sleep. Relaxed a little more in certain ways I find hard. Still no couch yoga for hours on end but working on it ;). Blogged twice, including more good good links perfect for checking out when bored at work. I obviously didn’t tell you that ;). Turned to podcasts, food prep and cleaning when I noticed I was eating my feelings. This did help refocus me at least a little. Finally started looking for a new laptop. It’s a work in progress but I know making this decision + investment [= getting back the ability to upload new pictures!] will also bring back my often missing blogging mojo. Not much to talk about in terms of actual accomplishments here – outside of basic unmentionworthy usuals – as my family was staying with us from Wednesday until Sunday afternoon. Coming up on Thursday – fingers crossed for the internet working! – is another episode on the little or bigger differences between Germany and the US. Happiness-inducing today: Walking home in the gorgeous sunshine. All the Vitamin D ;). Tell me three [or more] achievements from your past week! Hello there, Sunday. You came faster than expected. Which also means it’s time to share some of my favourite posts found in the past two weeks with you again. With too many thoughts on my mind right now, I won’t say much more than enjoy and have a happy – hopefully sun-filled – Sunday! If you saw any other great posts feel free to share them in the comments. In a time of political arousal all around, this one brings up good pointson why taking care of our own well-being and the issues we battle daily still isn’t entirely selfish. Relieving and at the same time an invitation to get thinking about your underlying reasons for questioning whether you fit in or not. Raise your hand if you put things off because they ‘take too long right now’. If so, this post might prove you wrong [and it totally did for me]. If you’re constantly rushing around and schedule something for every waking minute, this one’s for you. There’s no arguing these reasons. A great reminder for all of us needing to gain weight but finding it so very hard mentally. There’s more to gain back than just the weight. Mind your language! Knowledge about [healthy] food is good but don’t let it take away from your [and others’] pleasure in eating whatever you want. A lesson on appreciating [and living in] the now and yourself for who you are and how you look like. Sound advice that is a lot better than crash dieting or missing out on all the fun [food and elsewise]. Ever doubt everything about yourself so strongly it keeps you from getting anything done? This one’s for you. No two people life journeys look the exact same and that’s not just okay but what makes life interesting. What makes others happy doesn’t have to be true for you so don’t let comparison or other people’s expectations get you stressed out. For readers: how to tell if the blogger you’re following is making an effort to gain not just readers but some coins. For bloggers: how to do just that. Because we all can’t constantly create new content – here’s how to let those oldies but goodies shine again. Cuteness overload! I’m not one to watch funny cat videos but these are plain amazing. No ice cream maker? No problem. This no-churn cross between nice cream and (duh!) ice cream just calls for a blender. Just how amazing do these sound?! The flavour combination is so unique and perfect for berry season coming up. The sneaky flour sub in this skillet of chocolatey deliciousness promises a whole lot of flavor. One of those intriguing natural vegan meat replacements I have yet to try but this looks amazing. With filling buckwheat, lentils and cheese this is serious comfort food that also offers some nutritional benefits. Win-win. Seitan – though I’m not eating it often enough [lazy!] – is my favourite meat replacement and Faith’s dish sounds amazing and so creamy. Mango is such a great addition to curry and this vegan one packs in some legume protein, too. Happiness-inducing today: Time with the family and sunshine. Summer Spring is really picking up around here now. Hello! It’s been a while [after how many times does that saying get too old?]. I could go into a lengthy explanation of the why but nobody really wants to read that. Long story short: Life is never short of surprises; both of the good and bad kind which can throw you off. There’s are a lot of things I need to work on both physically and mentally. Vague-blogging isn’t cool so I’ll leave it at this and make an effort to get back into the blogging game for real now. Because I miss it. Right now, my mind is filled with a lot of unsorted thoughts that led to me rewriting this intro about five times until deciding to keep it short. Life has been a whirlwind, an up-and-down of good and bad days lately. A lot I’m processing and need to work through but rather than delve into all of that so I’ll focus on the past weeks’ – mostly the one week that just passed but two mention-worthy happenings from a previous one – positives. Because even in the hard times there’s some sunshine. Quite literally around these parts lately and I’m not complaining. Sunshine can make tough times a little more bearable, agreed? Linking up with Meg whose amazing time management and mum skills I’m even more impressed by these days [you’ll know why in a minute]. Worked the same schedule as always. We’ve been getting a lot of new clients lately which has been keeping me busy. Tested the waters of finding a new job. As you might know, I’m not happy in my current job – or better yet since I’m not hating it: unsatisfied by it. That’s why I keep looking for others yet opportunities are rare in my field. Long story short: I found a job offer, applied and was invited for not only an interview but a mini assessment center of sorts [which in this field meant spending a day at the editorial office writing a few articles]. Geesh did I not expect that kind of anxiety leading up to the day. We’re talking loss of appetite, panicking about whatever might go wrong – the whole bandwidth of nervousness. And in the end? A major train delay aside – thanks for nothing, Deutsche Bahn – things went pretty well and I got a good feedback on my work. While I found out I didn’t get the job the next week [a local candidate did] – which, while a little bummer, was probably just right as the day there showed me this wasn’t what I could see myself doing for years – I still gained something from it. Confidence. In presenting myself and my writing skills [self-doubt is a huge constant issue for me]. Soaked up the sunshine we’ve finally been getting more of whenever I could. It’s a surefire happiness booster and hey there, Vitamin D! Babysat P.. I’d say it was good. Not amazing – hey, first time – but good. Does anybody else find that babysitting a toddler for the first time is a lot like first dates? There’s the “I hope he likes me” and “what if we run out of things to talk about [or in the toddler case: play]?” Luckily, P. truly seems to like me 😉 and while we did run out of activities – couldn’t colouring have been interesting for longer than five minutes, dear?? – I had an emergency backup plan. More specifically: P.’s hot new ride. When nothing helped distract him anymore into the Croozer – luckily, P.’s a huge fan of it – it was and out for a walk. He fell asleep soon and didn’t wake up until about 1 1/2 hours later when we snuggled for a bit and played in his little sand pit. I think I’m not meant to be a mum [just yet or ever], though. How do you amazing ladies do this every single day, never run out of ideas and carry a smile all throughout? Spring-cleaned for the second time. Just how many nooks and crannies can a single apartment have?? I’m slowly, ever so slowly, getting better at this keeping things neat thing. If you excuse me for a second right here – I need to find some wood to knock on. Finally exchanged the dust bag in my vacuum cleaner. One of those “takes too much time right now – I’ll do it later [or never]” tasks that actually takes no time at all and makes a true difference. Prepared multiple batches of peanut butter – going through copious amounts lately – and one of healthy vegan “Nutella” without sacrificing any fingers. Win! If you haven’t tried that recipe yet, you really should. Just sayin’. Wrote a few post drafts to share the next few weeks so I won’t just disappear again. Coming up next, though, are more good good links on Sunday. Treated myself to several bars of Lindt – they’re having a special offer at the moment – and a new sudoku booklet. The latter actually excited me the most because they’re part of my dinner routine but I had come to the final page of my previous book. Any other sudoku fans? Confession: I was super late in assembling today’s post. With family around and my mind pondering many things lately, I’ve been neglecting the blog and blog world as a whole lately. Sorry for just disappearing at times. I’m not going to give up blogging, only need some time to figure things out here and there. Ah well, no more vague-rambling but some great posts for your reading pleasure. As always feel free to drop links to posts that made you think or feel inspired lately in the comments. Newsflash [for the males out there]: Women aren’t constantly trying to be eye candy for male gazes and definitely don’t need anybody’s stamp of approval for any choices they make [clothes, make-up or whichever else ones]. True. Powerful. Some might be a little hard to swallow if you already made them [raising my hand] but also provide the chance to better yourself in the future. Not too late yet. When social media does more harm than good – hi, anxiety and stress- we might need to rethink our relationship with it. An important and in-depth post on how to be a good friend in one of the hardest situations a couple can experience. As much as I hope as few mums/dads as possible have to experience this, having a support squad would be so needed. Wise beyond her years, Hannah shares some lessons many of us will find relieving to hear. #1 has been key in my life for the past months and the others listed here are really good, too [who else needs to work on the tab situation??]. So much yes! Authenticity is a core value and what draws me to other accounts on social media. Don’t tell me I was the only one feeling relieved reading through this list! Finally some research proving gluten is by far not the evil its made up to be. Getting to the [mental] place where working out and moving in general are gentle and in line with what we need that exact day [= intuitive] can be hard but is so worth working on. A great addition to the above post, this one helps figure out if working out on vacation is what you truly need [i.e. enhancing the experience] or forced. As horrible as they are, EDs can also have [major] positive impacts on some people’s lives. Kat’s story is a beautiful example of one such case. Body-positivity, recovery inspiration and guaranteed to make you feel at least a little more at peace with yourself. Well, after watching this I’d say I’m semi-normal ;). Because who doesn’t ever need some happiness-inducers in their life?! Don’t click over if hungry. Or just get ready for what vegan chocolate-filled dreams are made of. Millet usually isn’t my favourite grain but this looks so dreamily creamy. Sometimes it’s the simple things and this looks incredibly luscious while being made from natural ingredients and without refined sugar. A really creative alternative for those with pesky peanut or nut allergies. Neither a fan of salads in general nor quinoa the fact this really appeals to me says a lot. These might just be one the easiest to prepare taco bowls out there –and still so flavor- and beautiful. Now I might not be a bread person but this? You eat with your eyes after all. Happiness-inducing today: Babysitting P. No more aunt gushing here but damn, that little guy stole my heart. Bloggers, raise your hand if you’ve been in a writing rut lately. Well, that’s been me these days and I’m not enjoying it. Some weeks thoughts and ideas are flowing through my brain faster than I can grab a pen – or access my phone – to write them down and others nothing goes. Ironically, just when I had mentally decided to give in and simply do some random Thinking out loud, one of the points I initially noted got my mind churning again. So I’ll reserve that one for another day but share some other randomness today to avoid falling out of the blogging loop completely. Let’s get going! Tell me: how do you – especially those of you in the US – prepare your tea? Or more specifically: how do you heat the water needed for it? A little birdy told me electric kettles aren’t really popular which stumped me because I’d never used anything else. Until now because – cue the tragical music – my kettle just quit its services [read: it broke]. On Sunday of all possible times obviously = no chance to get a new one right then and there . Thrifty as I am I wasn’t ready to invest in a new one yet so have been relying on cooking water on the stove. I won’t lie in saying it first felt – okay, still feels – like a huge inconvience. But at that it also made me appreciate the daily convience I’m blessed to have every single day; hardly ever acknowledging the whole of it. If it’s between me and you, though, I do feel so priviled every time I just have a glass of tap water without worrying about germs and simply looking at the fact it’s so readily available to me. Another thing in my kitchen I couldn’t don’t want to live without? Hands down my dishwasher. While I do a few dishes by hand if I want to reuse them again that day, just putting everything into the dishwasher at the end of the day and waking up to clean and dried dishes is amazing. A privilege I’m thankful for every single day. Speaking of privilege: I stumbled upon this article the other day. It’s about the British chef Ruby Tandoh pointing out that the healthy lifestyle many people – particularly those striving for high protein intake and low-carb – live these days simply isn’t affordable for some. Now I know there are many posts out there sharing great advice on how to eat healthy on a budget and it’s definitely not impossible [but might require more time, knowledge and careful planning than some people have or can bring up]. I encourage you to read the full post to see the points Tandoh makes, though. What I agree with and have noticed myself is – through my own experience as somebody eating lots of fruit and vegetables – that fresh produce can easily make up a good chunk of your grocery bills. For families with multiple children – like Tandoh’s and many of those living on the brink of or in poverty – getting adequate amounts of food in on a budget doesn’t allow for such luxuries. So shaming any foods (think potatoes, white rice, grains in general) is plain wrong and I wish society as a whole did less of it [if at all]. We’re all just trying our best in this world and don’t all have the same chances. Just some food for thought. Just like the privilege to buy almond butter. Thanks to Jen for the advice of keeping the unopened jar upside down for a day – it makes stirring so much easier. No huge oil spillage like on past occasions here and just a few clumps to smoothen out. Easy. Something more light-hearted on my currently very heavy/deeper thought-filled mind is seeing my sister and P. again on the weekend. It’s been a few [too many] weeks since the previous time and will be my first time babysitting P. all by myself. I won’t lie in saying I’m a little nervous [and hoping for no necessary diaper changes in those few hours ;)]. Coming up for you on the weekend: more good good links! For once not turning this into an endlessly wordy post – you’ve had a lot of these coming from me lately – I’ll end this here. Happy Thursday! We’re –this- close to the weekend! Happiness-inducing today: My current book and an unexpected smile. Share your thoughts on any or all of the above points with me!